Although all our stores are unique, this is our largest store. We import everything we sell. As direct importers we can offer our customers the best selection and value. The store is packed with merchandise from our many overseas trips over the past 35 years. We sell Sterling Silver Jewelry with a variety of Gemstones. We also stock a large selection of Italian Sterling Silver chain. We offer many lines of costume and seashell Jewelry. We also sell rustic furniture, teak root furniture, old boat furniture, terracotta pottery, talavera tile, Mexican clay chimeneas, metal art, wood carvings, stone fountains, carved tikis and tiki masks, air plants, Indonesian batik sarongs, batik handmade purses and bags, incense, candles and gifts and decorative accessories from more than 17 different countries. Our variety and selection is second to none. Around The World Marketplace located next to the old City Gates sits at the entrance to the original old walled city in downtown Saint Augustine. Everything in St Augustine is about history and our building was built sometime after the civil war and our best guess is 1885. It was originally two homes but the two frame vernacular buildings were joined together in the 1920’s. It has been a commercial building since that time. We purchased and renovated the building in 1985 and have operated Around The World Marketplace since that time. 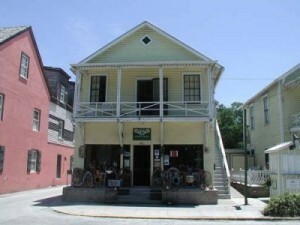 Sunburst Trading Company is located in beautiful St. Augustine, FL. © Copyright - Sunburst Trading Company. Website by St. Augustine Web Design in beautiful St. Augustine, Florida.